This website is about a bus company and what it meant to the area it served. Its also about a town, or more accurately a group of towns, that depended on their buses. There's some local history and historical locals. Some things world-famous, others near impenetrable to anyone from outside the area. A celebration and a terrible disaster. And a prodigal's return. The Medway Towns sit next to the estuarial River Medway in north Kent, approximately 30 miles east south-east from London where the Dover road crosses the river. A major military centre by the time of Trafalgar, the concentration of Royal Marines, Royal Engineers and the Naval Barracks around the 16th Century Royal Dockyard at Chatham had prompted development throughout the Medway Towns, with an ever-increasing population needing to travel to work in the supporting industries. 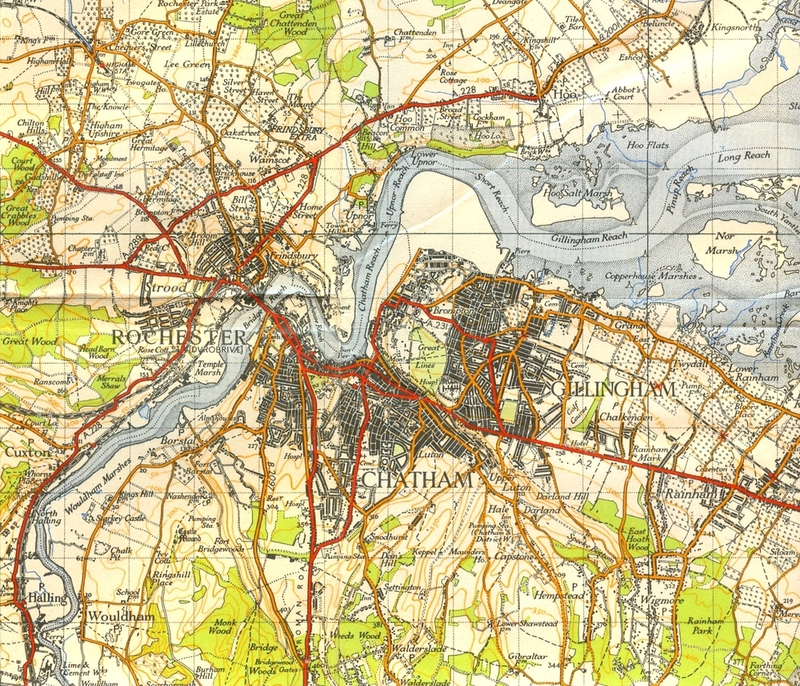 Most of these were near the river in Rochester and Strood, whereas 19th and 20th century housing spread up steep-sided tributary valleys in Chatham and up the dip slope of the Downs above Gillingham. 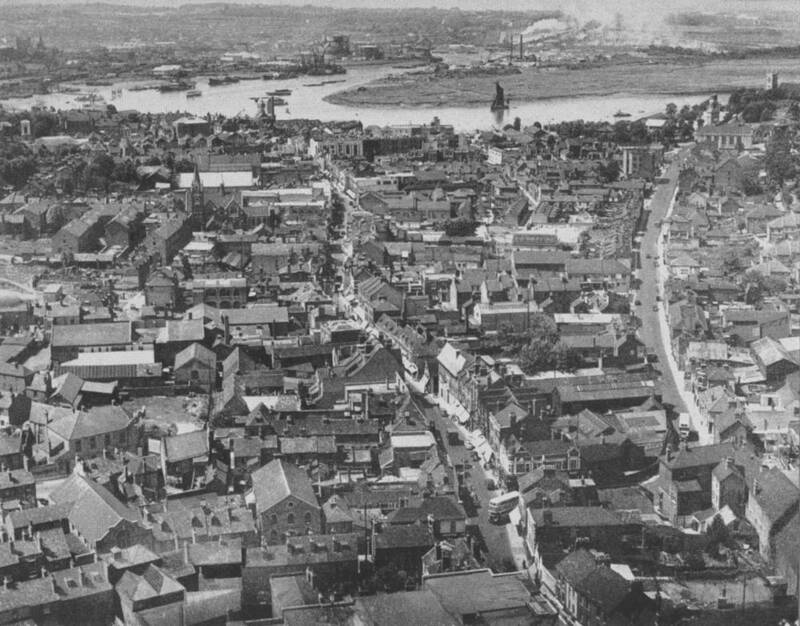 General View of Chatham, probably around 1950. A Chatham Traction bus is turning from the Brook into the High Street, flanked by "The White Lion" and Hadaway's, the seed merchant.. Another bus heads along the Brook for the Town Hall. The Chatham & District Traction Company was just a passing phase in the life of the Towns and their transport. This record looks not just at its origins, its life and its passing, but at the way it was central to the lives of many people, and how it generated the underlying affection and tolerance associated with public service organisations everywhere. Its shortcomings might be viewed with amusement or irritation, but its efforts to provide a reliable service every day could not be questioned. In the days before widespread car ownership the bus was the usual form of local transport for most people. Reassuring and familiar, the buses were a dependable sign that all was well and normal. Rooted in their locality, Chatham Traction was by Medway folk for Medway folk. Dockyard mateys and school kids, new-estate shoppers and weekend revellers all depended on the buses. A sizeable proportion of company staff lived close by the depot at Luton, adding to a sense of community. This map dates from 1940 - the naval Dockyard is blanked out. But as ever, you don't know what you've got 'til it's gone. The absorption by Maidstone & District in 1955 gave rise to a sense of loss and took away a Medway institution that started in 1902 with the trams. Also gone, within a year or so, was the unique ginger-brown that gave Chatham Traction it's local name - the "brahn buses", in contrast to M&D's green. The extent of people's recollections about Chatham Traction has been amazing. Thanks are due to all those people of a certain age who have willingly told us their stories and unearthed treasured items recalling the buses, and who remember the dependency and affection the buses generated.